solutions applied in the infrastructure projects and terrain stabilization, we focus on the feasibility and durability of the solutions. GeoGlobe® Europe takes care to offer today’s customized solutions harmoniously combining the technical performance at the level of civil engineering with the human pledge including the socioeconomic development and the ecological engineering in respect to the environment for a more stable future. A typical rainfall curve in those very dry areas, where the heavy rains, even rare, have resulted in very serious soil erosion. 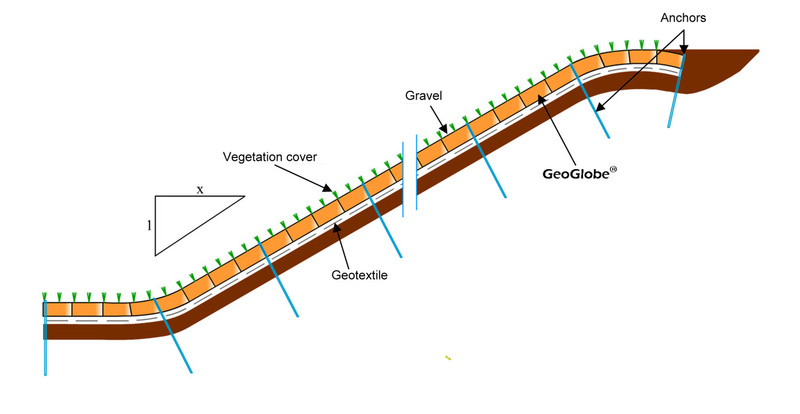 To protect the slope from erosion by GeoGlobe® taking into account the geological and climatic conditions. The construction of retaining walls, built to reinforce the terrain was not cost-effective because of its excessive cost. The projection of the concrete (shotcrete) is too expensive and constitutes a real scar to the landscape. order to obtain maximum stability and control of the terrain erosion while ensuring the harmony with the landscape. After the upgrade of the terrain, a nonwoven geotextile is installed above which the firmly anchored units of GeoGlobe® are expanded and filled with gravel. The plants are planted and an irrigation-watering system is installed. vegetation and gravel offering a natural landscape appearance. Moreover, the gravel has the property to “break the hydraulic energy of the rain”, so the soil constituted from loess under the cover of the confinement system remains perfectly stable and does not suffer from erosion any more.